Is there a philosophical element in the Vedas? The answer depends on the way we define philosophy. If philosophy means intellectual enquiry or abstract conceptualising there is not much of this kind of philosophy in the Vedas except perhaps a few verses here and there. But if philosophy means ideas, perceptions, intuitions and conceptions of ultimate and universal truths of God, man, world or aim of life, then we have in the Vedas a deep and profound philosophy which is the source and foundation of one of the greatest philosophical traditions of the world. In the Vedas, Religion and Philosophy loose its distinction. Philosophy is the direct expression of an inner religious, psychological or spiritual intuition, experience or realization in poetry. And here again we see Vedas setting the trend and character of Indian philosophy as a whole. We may now briefly examine the central perceptions of Vedic Philosophy. We have already listed briefly the main discoveries of Vedic seers and discussed some of them in our earlier articles. Let us make a brief summary of the philosophical intuitions of Vedic seers and thinkers. The first and the most well-known statement of the Vedic seers is “The Reality is One, but the sages call it variously” Ekam sad vipra bahudha vadanthi. Though this Vedic verse is quoted frequently, the deeper significance of the verse is not fully understood. This verse negates the traditional western conception of the Veda as a polytheism. However we can not also say, based on this verse, Veda’s central message is monotheism. “Agni is That, Aditya is That, Vayu is That, Chandraman is That, the bright One is That Brahman is That, Apas are That, Prajapathi is That”. This is the reason why in many of the Vedic hymns each God is extolled as if he is the Supreme Divine. Each God is not only the Supreme but also contains all the other Gods within himself. This means the Divinity can not be or rather should not be confined into a single or fixed religious formula. Depending on the cosmic or terrestial needs of creation or evolution or the needs, temperament or the stage of evolution of the individual or community, the Supreme Divine can manifest or front Himself as nature-force, a cosmic power with a specific cosmic function, a God with a fixed attribute or a personal God with a limited name and form and qualities, keeping all other attributes and qualities behind, or a universal divine Person with infinite qualities but with no specific name and form or as an impersonal featureless and formless Reality beyond all name and form and qualities. All these are multiple spiritual poises or potentialities of the Divine Reality in which he dwells simultaneously, but he is also something inexpressible and absolute beyond all his “aspects”, poises, attributes or qualities. All these ideas may not be explicitly stated in the Vedas but implied in the Vedic conception of the divinity, which was developed fully in later Indian religion which was given the name Hinduism. A great Yogi of modern India, belonging to the Saiva Sidhantha school of Hinduism, conceived the Supreme Divine as the eternal Dancer who dances simultaneously in many postures. Each posture, when reflected in the human mind, gives birth to a unique and distinct spiritual experience, philosophy or religion. But the Supreme Dancer, while dwelling or present wholly in all His postures, is not exhausted by any or all of them. He is eternal and unchanging beyond the whirls and postures of His dance. The eternal dance itself may only be a poise in His unthinkable existence. There is the other poise of eternal and immobile silence. Or else the silence itself may be only a poise of His Dance, whirling so fast it appears as immobility. This is one of the spiritual intuitions of Hinduism which is present as a suggestive seed in the Vedic intuition of the Divinity. “Thousand headed is Purusha, thousand-eyed and thousand footed. Enveloping the earth on every side he exceeds it by ten fingers breath. Purusha is indeed this. All what has been and is yet to come and he is the Lord of immortality and of what grows by eating food – – – One quarter of him is all contingent beings, three quarters of him is what is immortal in heaven. With three-quarters of Purusha ascended one-quarter of him came into existence again down here. Thence he did he stride forth on every side amongst all that eats and does not eat”. The message and the symbolism is clear. The Purusha is at once immanent and transcendent. By “one quarter” of His being, he becomes the Universe and enters into the Universe, while the rest of the “three-quarters” of Him transcends the Universe. “Then neither Being or Non-being existed, neither atmosphere, nor the firmament, nor what is above it. What did it encompass? Where? In whose protection? What was water, the deep, unfaithamable. Neither death nor immortality was there then, no sign of night or day. The One breathed breathless by its own power not else but this existed then. In the beginning was darkness; enveloped in darkness; all this was but unmanifested water, whatever was, that One, coming into being, hidden by the void generated by the power of heat(Tapas). In the beginning desire (Kama) which was the first seed of mind covered it. Wise seers, searching in their heart, found the source of Being in the Non-being. Their cord was extended athwart. Was there anything below? Givers of seed there were, and powers, beneath was energy and above impulse. Who knows truly? Who can here declare whence it was been, whence is this emanation—who know whence it has arisen? This is undoubtedly exalted philosophy. But is it the work of a speculative intellect or the spontaneous expression of an inner intuition, vision or experience? This creation hymn of the Rig Veda and many such verses in the Veda which express philosophical conceptions proceed from an intuitive mind musing on a concrete inner perception of truth and not from the speculative intellect labouring over abstract conceptions. However, there are some verses in the Veda which seem to be the expression of an enquiry or quest, like for example the following verse in the Atharva Veda. But here also the quest seems to be more intuitive than intellectual. There is an intuitive sense of the Unity and source of all Gods and all creation and a query who could be this unity and source. As I begin to make the move from an abundant house of ciuncooss caring people, organic gardening, and clean living to the shelter of my car. I am really becoming aware of the things I accumulated and the attachment to my home that was beginning to form. Although I am now in a place in time where I am about to experience my life at the poorest I have ever been, I have never felt so happy and spiritually abundant as I do now. I am serving people with yoga, smiles, food, childcare, and even giving a few dollars I can muster to any sweet being with a sign begging for compassion on the street. All this and doing my best to keep meditating, writing in my book of virtues, and reading printed texts written by Pabongka Rinpoche on the principle teachings of Buddhism. Maybe it is crazy, but the entire world feels alive and I am soaking in this amazing experience. I feel rich knowing that my life is abundant regardless where I live or how well I can sustain myself. No matter where I am, I am home. The Vedas, the Bhagavad Gita, the teachings of Buddha, the Torah, etc. all have a wisdom to share that have been passed down through the ages. The breath of life and vibrancy from spiritual devotees before us have a sacred appreciation for the human experience that today many people have lost. Many religions, however they may teach and preach, seem to lack the means to put into practice a way of life that dives deep into the soul. Nor supports the listeners with tools to fulfill their part of the whole in order to truly spread more kindness and gratitude to all beings. We don’t put our spirituality and health in the forefront. Hence, we as people don’t know what we are living for anymore other than accept that we must live for ourselves only and strive for success through material gain. When did looking inside ourselves and playing & learning with others become a waste of time? Why are we less willing to spend the time or money to nourish our mind, body, and spirit first? Is it really okay to own a house full of things we never use? If so, why don’t we reflect more on what matters deeply to our heart? Why is it so hard to ask that we all make small changes to feed a being we don’t know or will never meet? Probably because it takes something bigger than simply caring, it takes an awakening to a certain level. To a level of energy we can’t quite understand with our 5 senses. We really have to feel beyond what we think we know about this life to truly live and breath it. Then again, never have I seen such beauty of both people and community so pressed and urging for spiritual fulfillment. To love and reach enlightenment for the sake of all living beings. What a wonderful vision and wish to put into practice. May others reach a state of constant peace and happiness and have the heart to help others to free themselves from suffering. Anyways thank you Swamiji. I look forward to reading more about instilling spiritual abundance in our lives, pure beings, and more on the the subtle forms of life. Thank you also to those beings who took the interest and had the patience to read my comment (which was simply inspired by this incredible blog). 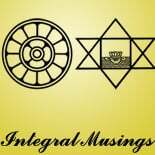 This entry was posted on April 26, 2013 by integralmusings in Indian civilisation & Culture.